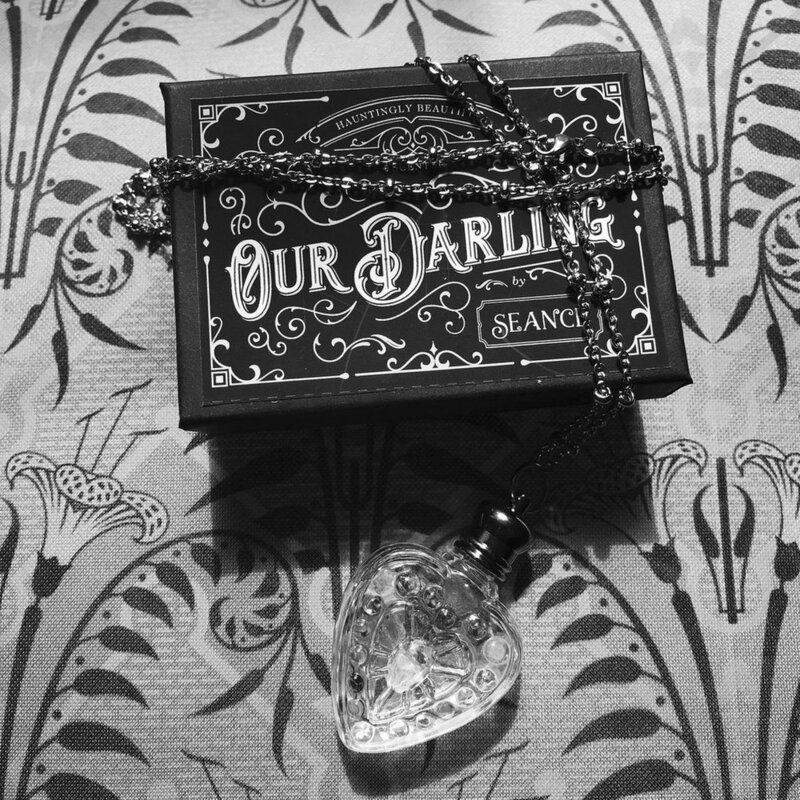 “Hauntingly beautiful scents for those who want to be remembered.” This is the phrase that Seance Perfumes uses to describe their products and it couldn’t be more true. 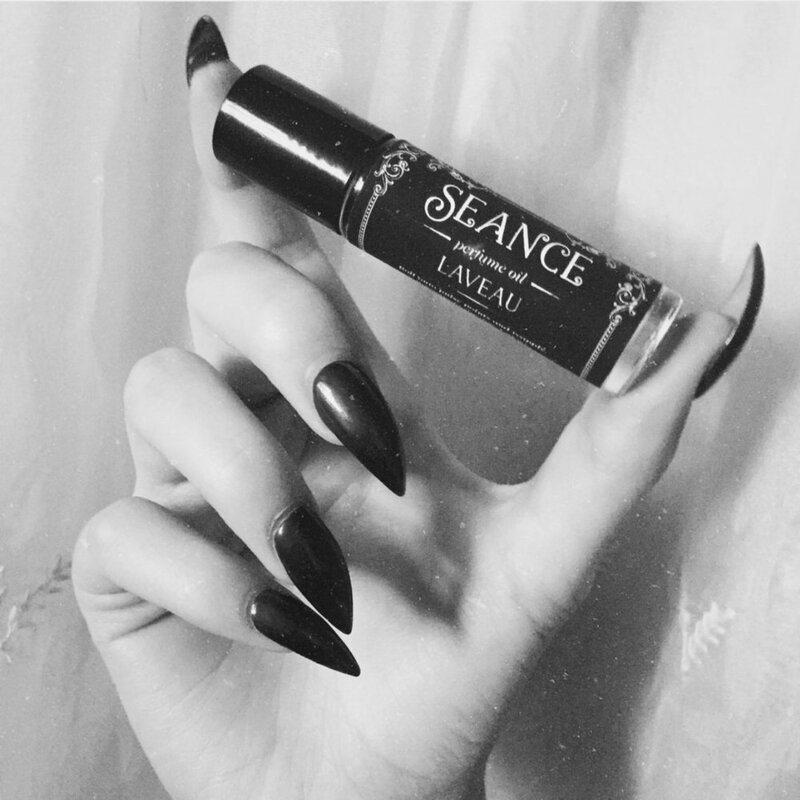 Since it is difficult to convey senses such as scent and taste in a photograph, Seance Perfumes first caught my eye through their beautifully curated and eerie instagram account with images that harken back to the Victorian age. Images of tear catchers, lace and ornate filigree complement their perfume bottles perfectly. I was also struck by how beautiful the packaging was for these products. Once I found out that they were carefully handmade in small batches I knew I wanted to try each one. I could easily write all day breaking down the various scents and what I think of them but instead felt it would be better to talk about the stories evoked by a few of my favorite products. I haven’t had the pleasure of trying their entire line yet but I have tried quite a few and have enjoyed making them a part of my daily routine. I’m someone who doesn’t usually like heavy strong scents and have found that the perfumes are perfect as you can layer them for a stronger effect or apply them lightly for a more delicate effect. Laveau is possibly my favorite perfume which was a surprise to me since I had never tried a perfume with these notes before. Scented with sandalwood and bourbon, this fragrance is meant to transport you to a cemetery in New Orleans where the powerful witch Marie Laveau is buried. To me this scent suggests hints of wisdom and confidence. While exploring haunted towns you might also end up in Salem where Seven Gables reminds us of a mansion painted black where the chilled winds blow through an aged garden. With notes of rose, cardamom and cedarwood this scent might remind you of being in a twisted forest as the first snow begins to fall. Boudoir and Parlor Ghost both bring us back to Victorian times reminding us both of what is seen and unseen. Boudoir is a pleasant mix of vanilla and grapefruit, containing warmth that might represent the glow of lanterns in a stately home. Parlor Ghost is more mysterious with notes of black tea, bergamot and lavender as complex as the patterned wallpaper and ornate decor of a haunted sitting room. Not only does Seance make beautiful perfume oils but they also have accompanying room sprays that can be used to mist your home or as body sprays as well. I was very excited when I saw the Halloween collection this fall which included limited time scents such as the perfume oil All Hallows Eve, October Shadows room spray and an Ichabod’s Dream candle. As a big fan of Sleepy Hollow I was eager to try out the pumpkin spiced candle. Not only does the packaging look beautiful amongst my autumn decorations but I was pleasantly surprised to find this candle to smell much different than other pumpkin scents I’ve tried before. It is both subtle and layered summoning images of flaming jack o lanterns and fallen leaves while still smelling sweet and spicy. All of Seance Perfumes scents can be found on their website and are beginning to materialize in many local oddities shops if you’re in the Los Angeles area. I’d also highly recommend following Seance on any and all social media as their images are sure to inspire. Have you tried any of Seance Perfumes’ products? Let me know which are your favorites!